Florida Atlantic University's Department of Biological Sciences maintains a research facility on the property. A public gallery is open for visitors to view the facility. 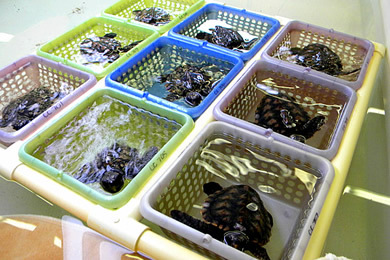 During the summer and fall sea turtle hatchlings can be viewed. Students are often working in the building and are happy to talk to visitors in the gallery. Dr. Jeanette Wyneken is doing a variety of sea turtle research such as the gender-ratio of hatchlings, swimming mechanics and anatomy. Learn more. Dr. Mike Salmon is studying the effects of lighting on the behavior of sea turtles as well as turtle behavior in their natural habitat. Learn more. Dr. Stephen Kajiura and his team of graduate students collect empirical data to investigate the true sensory capabilities of sharks and their relatives. Learn more. Visit Shark Lab. Dr. Marguerite Koch is studying the effects of high salt levels on seagrasses. Learn more.